Commissioner Thompson is retired from the Cushing Chamber of Commerce. 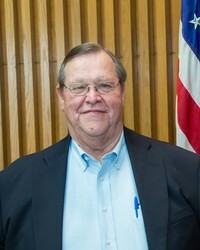 He currently serves as Vice Chairman of the Cushing Board of Commissioners as well as a liaison between the Commission and the Airport Advisory Board. His interests are sports and family. Commissioner Thompson has just begun filling a second 3 year term on the Commission.